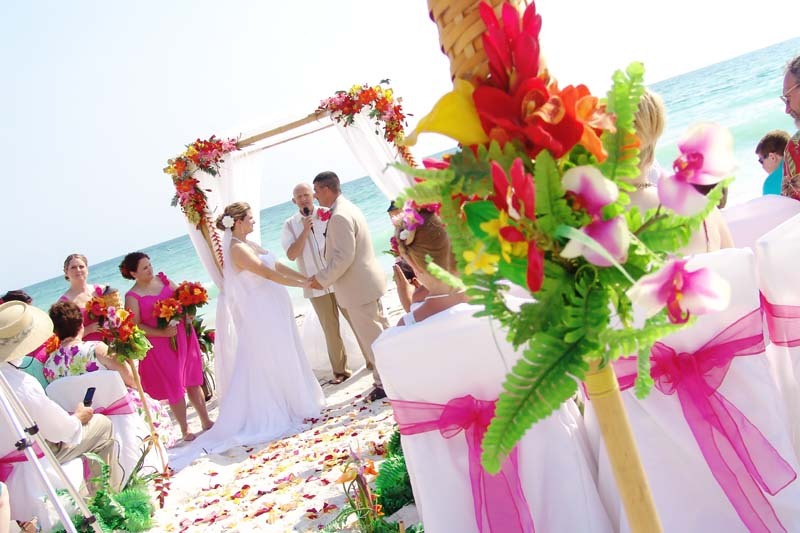 Do you wish to wear leis in your wedding ceremony? If yes, then a beautiful Hawaiian wedding can be just the right theme for you. 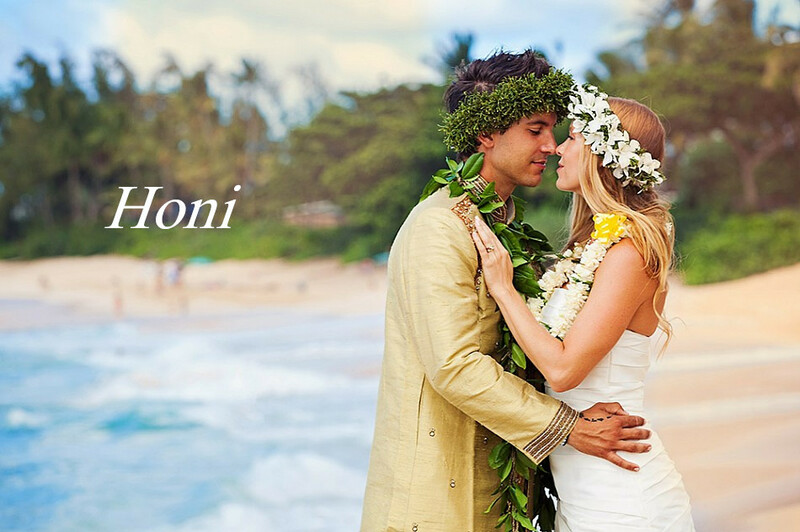 Whether you have decided to get married on a beach in Hawaii or a church in your county, there are several reasons to assimilate the wedding tradition in Hawaii. Apart from a light breezy tropical wedding theme, a Hawaiian wedding with its beautiful traditions will make your nuptials worth cherishing. So, if you want to know more about the different customs of weddings in Hawaii, then just keep on reading. Hawaiian leis and garlands are very important in the wedding. The lei flower is used to express respect and love. 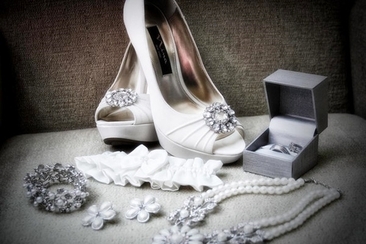 It is usually worn by the bride and groom, but it can be worn by the family members as well. Ideally, the lei garlands are exchanged between the bride and groom during the ceremony. 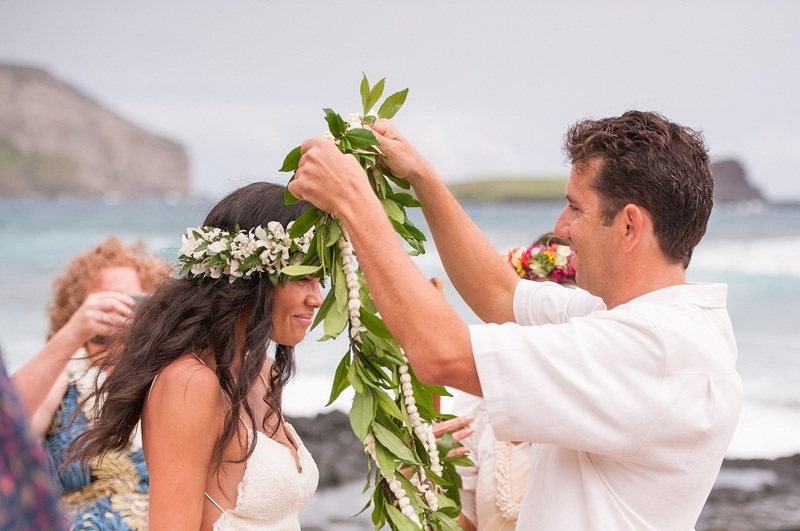 Lei garland signifies devotion, love and everlasting commitment to each other. Apart from the garland, the bride can use the flowers in her hair as well. Aloha shirts paired with neutral pants are considered standard wedding apparel for the groom and groomsmen. However, the traditional wedding apparel for a groom is usually white shirt paired with a colored sash worn on the waist. 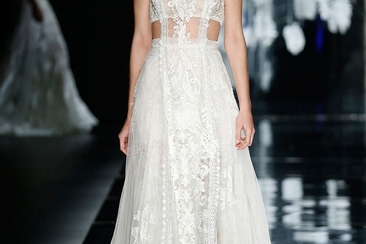 A bride on the other hand dons an all-white dress which can be a gown, a skirt or even the traditional island-wear. It is not mandatory for you to wear all white or neutral to your wedding. If you are fun loving, you can try wearing the authentic grass skirts and coconut bras as well. A Hawaiian wedding is incomplete without the traditional music. 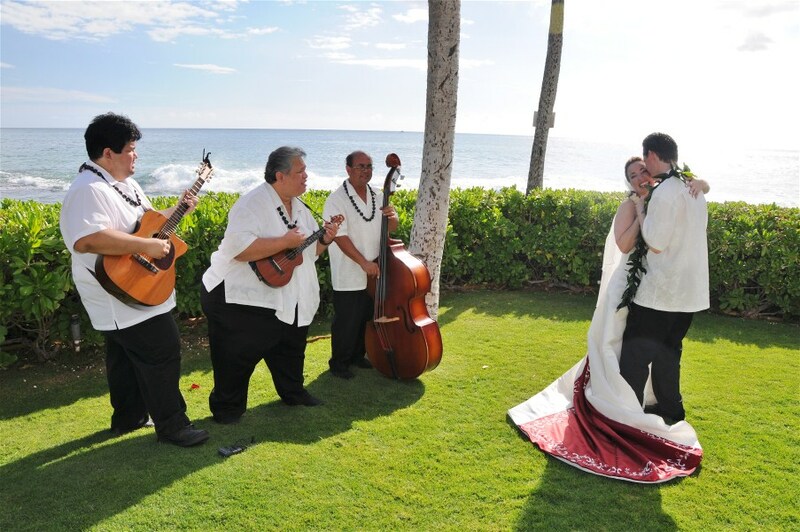 Ke Kali Nei Au is a customary wedding song, a must among wedding tradition in Hawaii. This song is played during the wedding ceremony and can also be played during the couple’s first dance. It was written by Charles King in 1926 in the Hawaiian language. Later on, the song was translated into English and song by many notable artists such as Elvis Presley. Ti Leaf and Koa wood hold a significant meaning in the Hawaiian ring blessing. Ti Leaf denotes health, prosperity and blessing of the mind, body and spirit. Koa wood is considered as a precious hardwood which denotes strength and integrity. Due to these significant values of Ti leaf and Koa wood, they are used during the wedding ceremony. The Koa wood is put into a bowl of water and thereafter, the leaf is dipped into the water bowl. A blessing chant is recited while sprinkling the water over the rings. Water also holds significance during this ceremony; it represents sending back all hindrances to the ocean as well as a new beginning for the couple. Another important ritual of the wedding, the Ti Leaf & lava rock rite represents the union of two people and an eternal commitment. Lava rock represents the commitment of the bride and groom to each other. 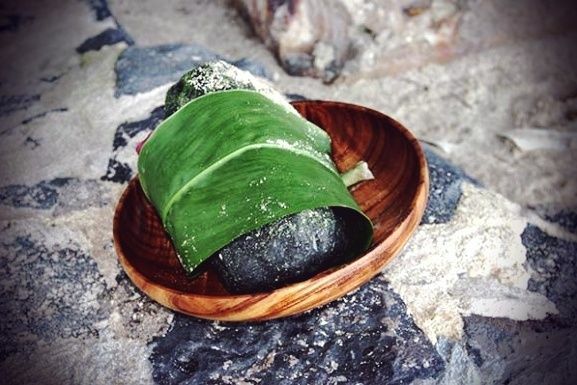 When wrapped in the Ti leaf, the lava rock is left as an offering at the location of wedding. 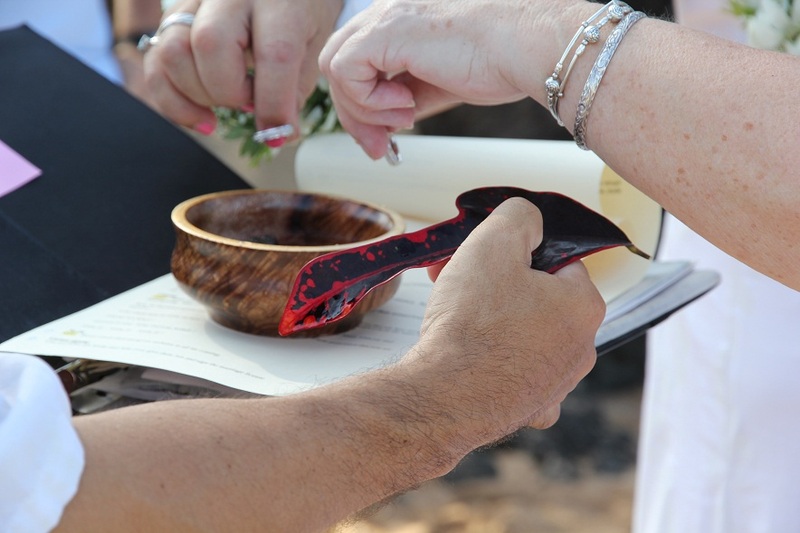 The purpose of Ti leaf and lava rock ritual is that it strengthens and blesses the union of the bride and groom. Wedding tradition in Hawaii has evolved and nowadays the ceremonies are conducted in Hawaiian as well as English language. The wedding rituals also include some Christian wedding ceremonies, but the ceremonies can be changed as per one’s religious beliefs. Ideally, a conch shell is blown during the beginning of the ceremony. The shell is blown 3 times to represent the Holy Trinity. During the ceremony, the leis are also exchanged, which is then followed by a kiss. Roman Catholic couples also often include a mass in the wedding ceremony. After the rings are exchanged, the couple says the wedding vows. At the end, the priest declares the couple as a husband and wife. 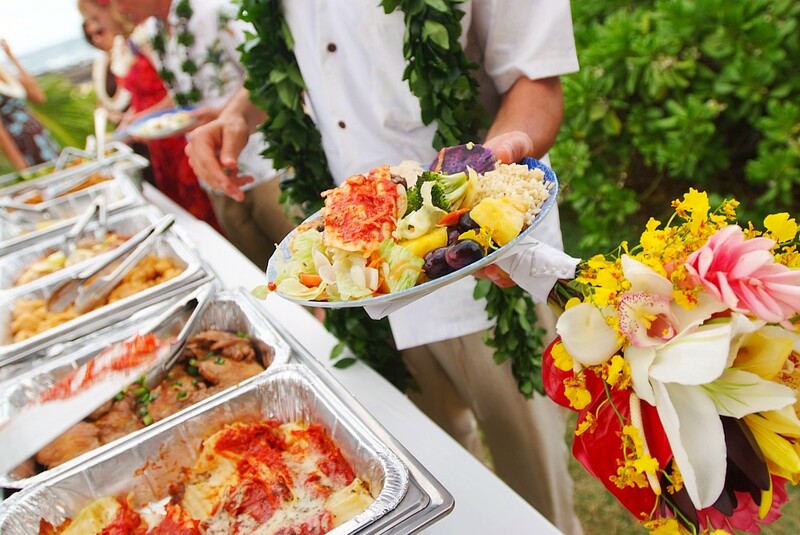 A traditional Hawaiian wedding makes use of all the local tropical produce. The feast usually includes lots of sea food, such as lobster, crab cakes, shrimp, and crabmeat. Apart from the sea food, the feast also includes roast pig, hirame, sashimi, tofu, spare ribs and moi poke. A lot of tropical fruits are also included in the feast such as mangos, oranges, kiwi, coconuts, oranges and coconuts to name a few. The wedding also includes drinks and punch which make use of the tropical fruits as well. There is no such traditional dance for the weddings in Hawaii. However, Pandanggo is performed by the natives of Philippines in which money is tied or taped around the newlywed couple. This is also called as money dance. This dance is usually considered important for any jovial celebration. As for those who are not from Philippine or don’t want typical wedding tradition in Hawaii, the regular dance along the beach side is enough. The bride and groom, if possible, can include these common words in their wedding vows. 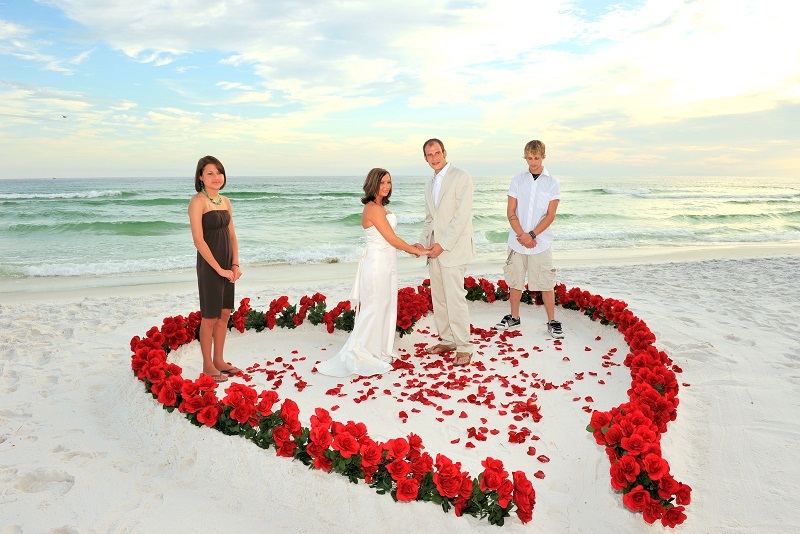 The wedding ceremony may also include additional rituals such as the circle of love and pouring of the sands. During the wedding, the couple stands in circle of love, which is created using the tropical fragrant flowers. Also, the couple may pour 2 colored sands inside a glass container, a ceremony called as pouring of the sands which signifies the unity of two people who become inseparable. 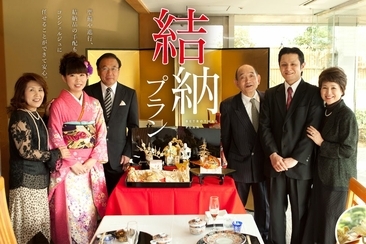 Fascinating traditional Japanese weddings have a lot to impress everyone. 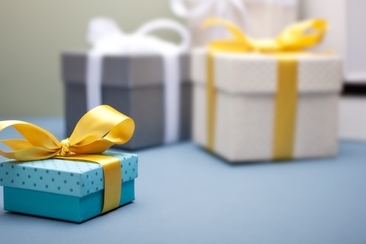 From san-san-kudo, wardrobe to gifts for parents and guests, learn more here. Are you going to be a part of an Italian wedding ceremony? Learn important wedding gift etiquette in Italy here and some else to have a great time during the ceremony. There are so many strange wedding traditions around the world that can surprise you, like meal in toilet bowel! You think you won't be surprised? Check out the list here! When did the tradition of something old, something new, something borrowed and something blue become a custom and what kind of items could be used? Read on to find out. 10 common wedding traditions explained here help you to understand the wedding ceremony better. You can also enjoy a video about strange wedding traditions.